Megan Gates is an active blogger who provides written work to the blogosphere pertaining to NYC Rentals, The Hamptons, home improvement and the latest architecture, design and fashion. Follow her on twitter @MEGatesDesign. As a homeowner, family member and friend, it is natural to have these special people in your life come visit and stay at your place. With that in mind, showcasing your house to its most beautiful potential is what any homeowner would want. Providing your guests with the comforts of their own home is impossible, but you can make it as close to home for them by providing a bit of luxury in a very important room of any house; the bathroom. 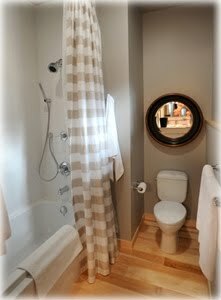 A guest bathroom should not be considered the half bath that is located close to the kitchen and family room. You want your guest bathroom to be a full bath that is in close proximity, preferably one or two rooms away from the guest bedroom. Making your guest have to use a bathroom far from their bedroom may make them feel uncomfortable. Also making a guest use a half bathroom most of the time and then a different full bathroom just for showering may also make your guest feel uncomfortable and feel as if they have no place to comfortably set out their toiletries. When you decorate your guest bathroom, keep the colors simple and relaxing. Guests are often already stressed about having to travel and use someone else's space. Minimize their tension by offering a space with aesthetics that are calming. Using white is often a clean and simple color that many hotels and spas use. Emulate their successful designing techniques in your own home. Use luxurious, fluffy towels and robes for comfort. Provide a stylish over the door rack for your guests to hang up their travel bags or to hang up their towels if they would like to reuse them. Add a touch of sophistication by adding some lightly scented candles or some fresh flowers to the vanity. When it comes to the functionality of the bathroom, realize that guests will utilize the room differently than you would use your own bathroom. Make the necessities easy to find. Keep clean towels on the rack and folded underneath the sink or on a shelving unit if you have one. If the bathroom is small, keep an extra one folded on the back of the toilet. Keep extra toilet paper stocked and easy to reach from the toilet. No need to make a guest stress about where to find that necessity! Add extra luxury and comfort by having extra toiletries stocked as well. Travel size shampoos, toothpaste, body wash and lotions, razors and even toothbrushes handy all help your guest transition into your space without a hitch. Use these ideas to fool your guests into thinking that they've stayed at a five star resort during their next visit! Share any other guest bathroom ideas you have here. So true. I agree with this one. Great advice! My guest bathroom has the similarities when it comes to its functionality and design. Glad to read this post. Thanks!